It is important to make claims based on evidence, particularly when the claims are not intuitive, as is the case with electromagnetic phenomenon. In this unit on Electromagnetics, we are in the third day of a multi-day investigation of electromagnetic phenomenon. Students have studied the electromagnetic spectrum and considered the properties of waves and the energies of different parts of the spectrum (HS-PS4-1). The investigation, however, has students confronting some of the less concrete aspects of electromagnetics: the wave-particle duality of light (HS-PS4-3) and the induction principles (HS-PS2-5) that tie the disciplines of electricity and magnetism together. In addition, the investigation provides a rich background for students to engage in several of the NGSS Science & Engineering Practices, including planning and carrying out investigations (#3) and analyzing and interpreting data (#4) among others. I take advantage of our 80-minute lesson time by providing a small amount of relevant content each day over the course of the investigation. Today, I share some thoughts about the induction of magnetic fields (HS-PS2-5) before students return to their lab work. In this way, I hope to weave the theory and the practice together to create a more meaningful experience. Though we are in the middle of a multi-day, multi-station investigation of electromagnetic properties, I take the time at the beginning of this lesson to add in some additional content related to one of the stations. Though some students have already completed work at this station (the induction of a magnetic field in a solenoid), their results will have more meaning with the background provided here. I begin the discussion with an image of a current-carrying wire. The illustration provides me a convenient way to highlight the invisible magnetic field that occurs as a result of the moving charges. I take some time to demonstrate one of the many "right-hand rules" that pervade electromagnetics - in this case, the determination of the magnetic field orientation based on the direction of the current. Finally, we unpack the equation, identifying the role of current (I), distance (r), and the magnetic permeability constant (u). Having established the induction of the magnetic field, I show how a wound wire can amplify the magnetic field. The device (a "solenoid") cleverly funnels the magnetic field from adjacent coils towards the inside of the core. We discuss the application of the right-hand rule, the packing of the wires to increase the amplifying effect, and the near-perfect cancellation of the magnetic field outside the solenoid. Student questions include the impact of filling the core with a metal, leading to a discussion of devices known as relays: metallic cylinders that move in response to the magnetic field and complete a circuit, thereby acting like a switch. I encourage students to use their data from this station - which is quite linear - to establish the number of turns per meter ("n") on the solenoid based on the equation provided in this segment of class. Before transitioning back to the investigation, I remind students of our goals and our process: each team is expected to move through all four stations to collect data in support of each of the four "Big Ideas:"
Students move to the back of the room to pick up materials that are relevant to their current station. I help teams get started and provide some oversight, particularly for those groups who may be starting new stations today. Teams are trying to collect data, at each station, that support Four Big Ideas of electromagnetics: light behaves like a wave, light behaves like a particle, and the two induction principles linking electricity with magnetism. The primary content learning targets are HS-PS4-3 and HS-PS2-5. In addition, the assessment of this activity rests squarely on the students' abilities to show how the evidence supports each of these fundamental ideas, directly connecting to the Science & Engineering practice of making arguments based on evidence. Here, students have successfully created the interference pattern that is evidence of light behaving like a wave. They are still playing with dimensions, discovering how the pattern spreads out when the screen is moved backwards. This is a beneficial step, as measuring the separation between bright spots is an essential part of this investigation. Here's another look at the kind of activity in this investigation - student teams are working with wind turbines, solenoids, and photocells. Though the phenomenon are different, the process is the same - collect data that demonstrate the validity of each of the Four Big Ideas of electromagnetics. Students work to collect data at each station then move on to another. As I circulate, I counsel teams to move to new stations if they have sufficient data. In addition, teams seek me out looking to confirm that their work at a given station is complete. The process takes time but the work is meaningful. Students continue in this mode until there are just a few minutes left in class, at which point we clean up and end class with some teams sharing results at the board. In the final few minutes, students come to the Smartboard to show some of the data collected today. This provides some time to celebrate and to set the bar for other teams - data this good or even better is possible. In this graph, student have shown how the photovoltaic output of a photocell has diminished with distance from a light source. Though the axes are not thoroughly labeled, the focus today is on the quality of the data and the way in which it may - or may not - provide evidence that light behaves like a particle. Indeed, with this data, one could still hold the idea that light behaves like a wave. We'll need more and different data to show how the wave model will be insufficient. Shown below is a summary of data from the wind turbine station. Here, the Big Idea is that a moving magnet can induce electric current. 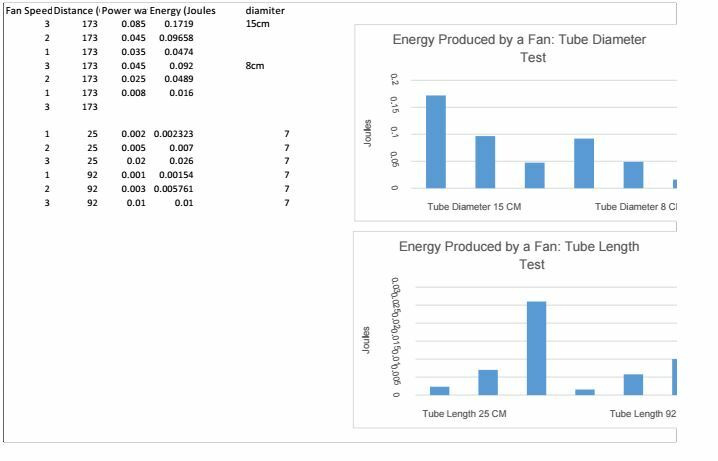 These students vary the column of air blowing on the turbine and the distance from the air source (a large floor fan). In each instance, their data supports the Big Idea that the amount of electric energy generated depends upon how fast the turbine turns. Class ends with these short but informative presentations at the board. Students seem energized by showing their high-quality data and discussing its value as evidence.